New £2750 plus VAT. delivered. 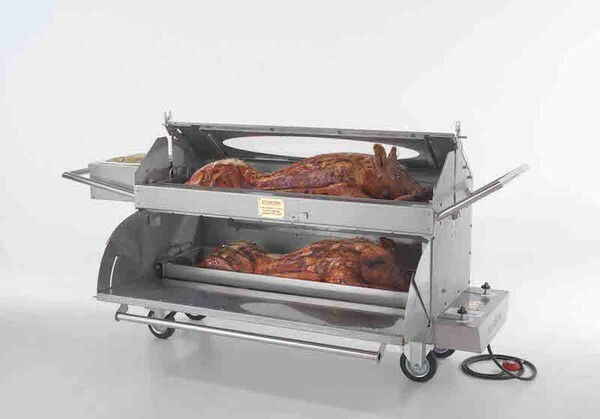 This fantastic hog roaster can cook two 70 kilo pigs and 4 boned and rolled legs at the same time. Meaning you can easily serve 600 people from one cook. 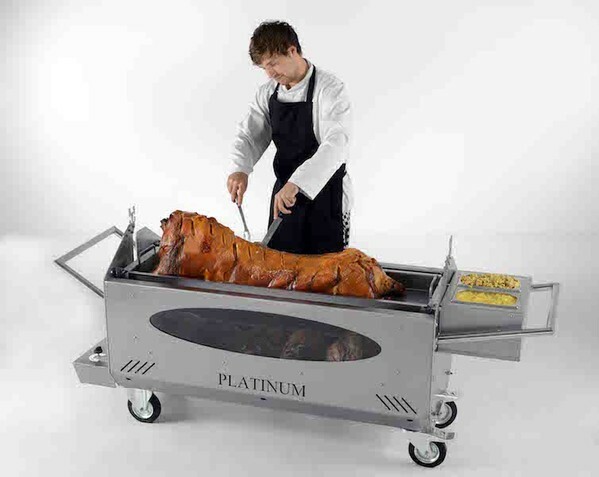 Once the top pig is raised you can continue using the bottom section to keep cooking. Therefore ensuring a constant supply of food. This makes it the most versatile hog roast machine available. 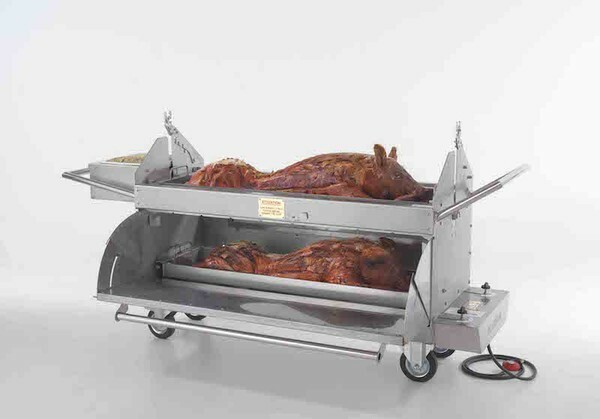 Ideal for selling sandwiches at events, keeps the top pig warm and has hot sauce containers making it self sufficient, keep taking extra meat from the bottom whilst serving or just swap the pigs over once the top one is finished. 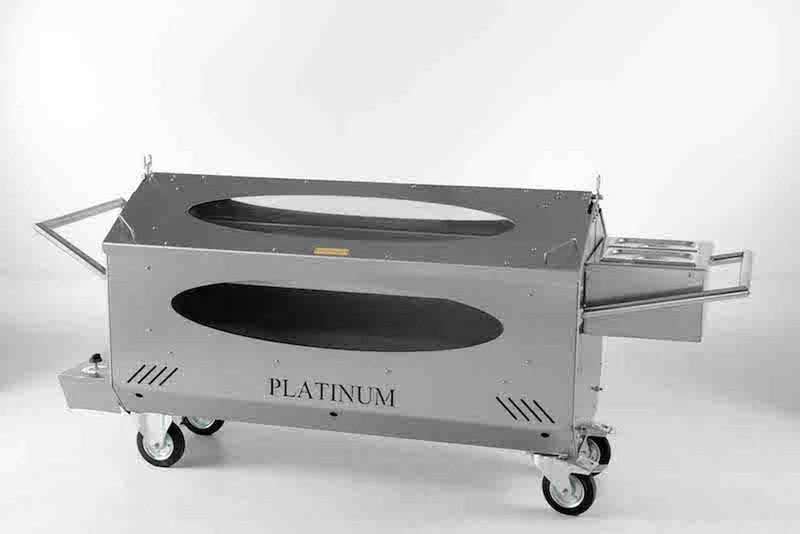 You can also use the trays to cook a variety of different products for events with a large or varied menu. 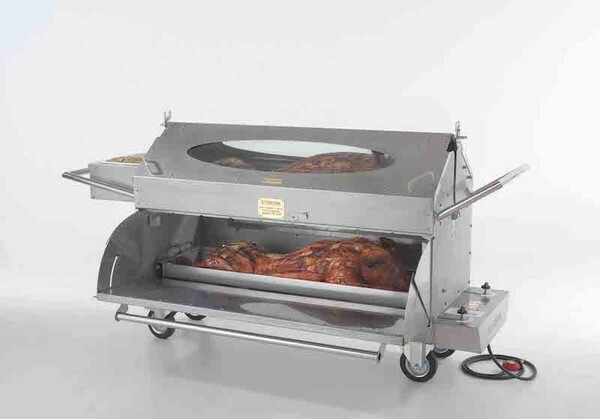 Pig in the top, lamb and vegetables in the bottom, run your bread through prior to service etc. There is no end to what this roaster can produce. This machine is a real must for the serious hog roaster. You can also buy a spit kit and a bbq to go with the machine. Fully stainless steel and super tough it will work hard and look great for years and years with just the minimum of servicing. You can bring your machine back to us for your annual service or we can send out a service kit and you can get a local engineer to do the service. The machine is 200cm long, 90cm wide and 100cm high. It weighs 160 kilos. We are open Monday to Friday 8am-6pm and Saturday mornings by appointment. Feel free to pop in anytime and have a look at our machines and have a tour of the factory. Everyone who visits is always very glad they did.